Life has been non-stop busy recently - I've been juggling my restaurant job in the evenings while literally packing up my life and all my belongings to go to Uni, and trying to see as much of my friends and family as possible before I leave. This, as you may have noticed, has left me with little time to blog this week *sob*. Moving away is such a daunting, big thing to do and as the time gets closer I'm realising more and more that I am actually packing up my things and leaving home. Having lived in one (very beautiful) area for the whole of my life, I'm excited about moving away to the buzz of a lively city and experiencing new places, cultures and people. I feel like a lucky dip bag of emotions at the moment - I'm happy, nervous, a teeny bit sad to be leaving and very excited. Anyway, that leads me (ish) to this next post. When clearing out and sorting through my things, I came across a few 'empties' (products that I've used every last drop of) and thought I'd feature them to tell you what I thought. There's no better feeling than finishing a product, whether it's the last squirt of foundation or the final drop of shampoo. There's just something so satisfying about knowing you've used every last drop of something, like you've really got your moneys worth. Just me? 1. L'oreal Elvive Smooth-Intense Anti-Frizz Shampoo - The very first thing that made me buy this shampoo was the ridiculously gorgeous smell that wafted from the bottle when I opened the lid. I'm a sucker for scents and unfortunately, yes, if a product smells good then chances are I'll buy it regardless of what it actually does. Luckily, this lovely smelling shampoo didn't let me down and was very good for my hair. Enriched with Moroccan Argan Oil and thermo protect, this shampoo is aimed at taming and nourishing dry and frizzy hair, and it does just that. After each use my hair felt incredibly smooth, soft and manageable and was always left looking silky with a healthy shine. The only negative thing I have to say about this shampoo is that after using it, my hair would get greasier and need washing again more quickly than with other shampoos. I'm not sure if it's a personal reaction to the shampoo (perhaps the Argan Oil is slightly too oily for my hair causing it to go a bit greasy) but, for me, it let the shampoo down and stopped it from being a 10/10. 2. L'oreal Elvive Fibrology Thickening Shampoo - You've probably seen the adverts, read a review, heard about the impressive stats behind this shampoo or maybe even tried it for yourself, right? Whichever way you've heard about it, you should know that this shampoo is pretty big in the hair industry at the moment. Using filloxane to 'penetrate and expand' hair, L'oreal's thickening shampoo is proven to 'increase the diameter of every fibre' leaving your hair looking visibly thicker. Obviously wanting to see what the fuss was about, I bought myself the thickening shampoo in hopes of thick Rapunzel-type locks by morning. L'oreal are never ones to bring out a bad-smelling shampoo, and once again I love the smell of this shampoo, but that's probably about as far as it goes. I continued to use the shampoo until it was empty because I was hoping for a sudden outburst of thick, glorious hair, but after using the whole bottle I am disappointed to say I've seen no change in my own hair. After using, my hair admittedly looks more lively and nourished but I haven't noticed any difference in thickness or texture. Boo! 3. The Body Shop Banana Shampoo - As you may already know, this was recommended to me by another blogger and has already featured in one of my posts (which you can read HERE). Before this shampoo, I had never tried any of The Body Shop's shampoos and have to say I'm a teeny bit impressed. Made with banana puree and Community Fair Trade honey, this fruity shampoo leaves my hair feeling super soft, shiny, smooth and smelling good enough to eat. For me personally, £4.50 is quite a lot of pennies to spend on a shampoo, but the fruity smell and conditioning properties of the shampoo make it worth it. I'll definitely be treating myself to this little beauty again! 4. Batiste Oriental Dry Shampoo - Dry shampoo is one of my favourite hair products and is always packed up in my bag when I go away on holiday or out overnight. Whether I use it for a quick little boost of volume, to freshen up unwashed hair or to revitalise and add texture, it's my saviour. Having tried quite a few different brands of dry shampoo, I have to say that Batiste is up there with the best and always the one I go for. The 'oriental' one is so far my favourite - light, delicate and floral, it smells nice and always instantly refreshes my hair. There have and will be many more Batiste empties! 5. Original Source Pure Lime Shower Gel - Confession time: this is actually Oscar's, but it has made its way into my empties post just by being so damn nice. When shopping for shower gels, I usually go for light and floral smells as I love delicate and girly scents, but Oscar has really shaken up my shower gel preferences with this strong zingy lime shower gel by Original Source. Having never tried any Original Source shower gels before, I am now what some of you may call 'changed'. I have sold my soul to the Original Source devil. This shower gel is a powerful zingy scent that is 'packed with 100% essential oils', is completely natural and is in a fully recyclable bottle (there's nothing like having a shower and knowing you're doing some good for the world in the process). 40 real limes have been jammed into this gorgeous fruity shower gel, and there's nothing better than waking up in the morning and having a zingy refreshing shower! Top marks Original Source. 6. 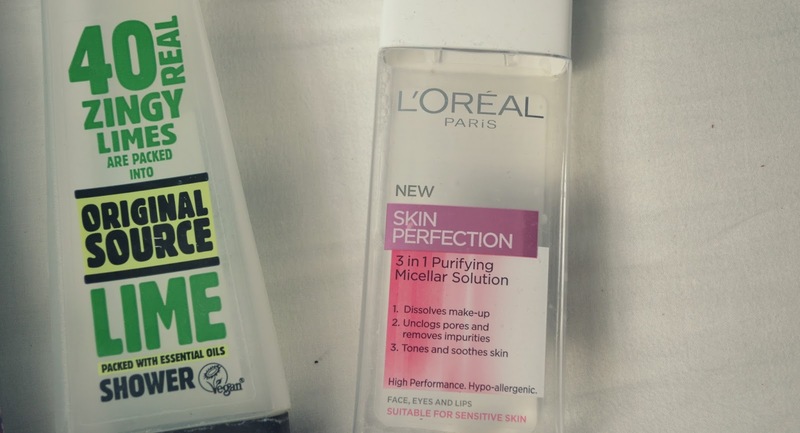 L'oreal Paris Skin Perfection Micellar Solution - To be quite honest, I've been meaning to blog about this micellar water for a long time. I ditched the face wipes about four months ago and have since been using cotton pads and L'oreal's micellar water. The beauty world has been crazy about this new skin solution for a while now, and I have to say I'm crazy about it too. Since throwing out my face wipes, my skin has been clear, healthy and with minimal spots. I use the water each night to take my make up off and again in the morning to refresh my skin. 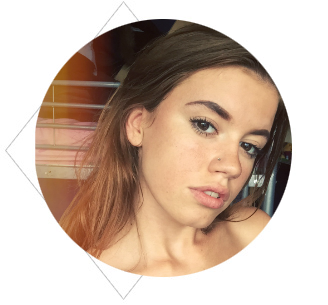 The solution removes every trace of makeup and leaves my skin feeling hydrated and smooth without feeling sticky. I'm already half way through my next bottle, and definitely recommend to everyone. I have tried original source and I like their stuff. The chocolate body wash is fun. I haven't tried the chocolate one yet, but definitely want to now! Sounds so good. I love Body Shop's banana shampoo. I used to used it a few years ago. No vibram here, the sole is rubber duo. It is flexible. chaussure salomon pas cher The grip is very good on dry ground. With alertness, behavior is good in the wet grass and scree. I soldes salomon chaussure happened to slide over the rubble and crossing a stream. But even loaded, the overall behavior is good. Rest with a stiffer sole, the shoe would be more versatile. Salomon Speedcross 3 Pas Cher At Keen not Gore-tex membrane but own brand, "Keen- Dry."